AGC Maine Build Maine Awards Presented in Partnership with Cross Insurance and ETTI, Inc.
AUGUSTA — The Associated General Contractors of Maine awarded five projects as best of the year with a celebration dinner held Wednesday, April 11, at the Augusta Civic Center. The dinner was held in conjunction with the National Association of Women in Construction’s one-day vendor show, and career fair known as the Construction Showcase. “There are many great projects completed throughout the year, and while we highlight the judge’s selections as best of their respective division, we hope that it brings attention to the amazing skills of Maine workers,” said Matt Marks of AGC Maine. Five projects were selected from different divisions that included building, highway/bridge, Municipal/Marine, Environmental, and Industrial & Utility. Applicants are grouped into their respective divisions, which might be modified based on the project scopes. They are judged on criteria including; contribution to the community, innovation in construction techniques or materials, meeting the challenge of a difficult job, environmental sensitivity, responsiveness to client needs and safety. Combined, the projects logged more than 258,690 working hours. “Hopefully the projects inspire students to consider a career in construction and a new generation that can be proud to say ‘I built this’,” Marks stated. 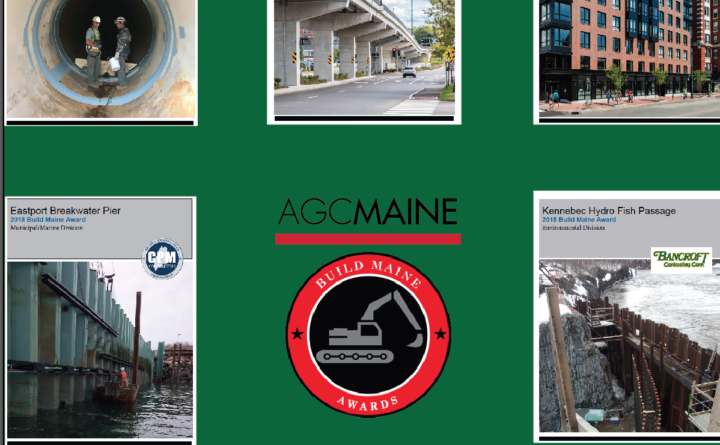 For information on the winning projects visit www.agcmaine.org/buildmaineawards.